Tanghalang Pilipino, the resident theater company of the Cultural Center of the Philippines (CCP), concludes its 25th Theater Season with EYEBALL: New Visions in Philippine Theater. This production features four (4) of the best plays from the Virgin Labfest, the annual festival of new works usually being held in late June to early July. 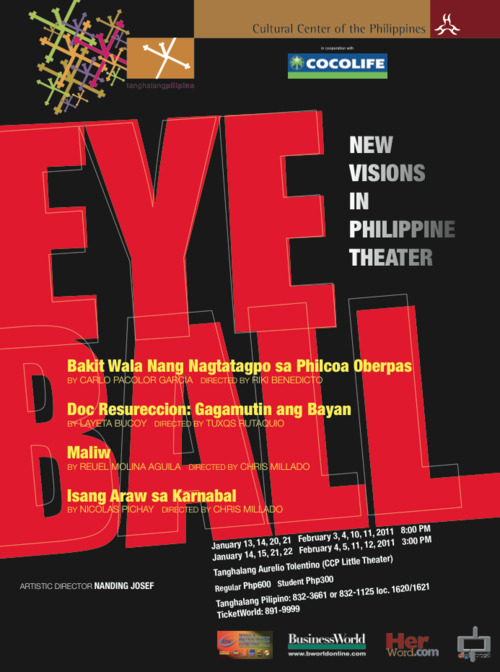 Eyeball is showing on January 13 to February 12, 2012 at the CCP Tanghalang Aurelio Tolentino (Little Theater). The 4 plays deal with the theme, “Searching” and tackle man’s search for love, for lost family bonds, for noble ideals, for closure, and for missing loved ones. Set-A includes Carlo Pacolor Garcia’s hilarious Bakit Wala Nang Nagtatagpo sa Philcoa Oberpas, directed by Riki Benedicto, which tells the story of a man and a woman who decide to meet at the Philcoa Overpass after months of flirting online. The cast includes TP Actors Company members Jonathan Tadioan, Jelson Bay, Martha Comia, Marco Viaña and Gino Ramirez; and guest artists Pam Hundana and Carmina Capile. In Doc Resureccion: Gagamutin ang Bayan, by Layeta Bucoy (Directed by Tuxqs Rutaqio), a well-meaning doctor runs for Mayor only to find out that the community he so wanted to help desires a different path for itself. This intriguing work features action-packed performances of Riki Benedicto, Jonathan Tadioan, Rayna Reyes and Miss Sherry Lara. Set-B is composed of plays directed by the exceptional director Chris Millado. In Reuel Molina Aguila’s Maliw, five years after the forced-disappearance of her eldest daughter, a mother confronts the question: How does one close a chapter still to be written? The play is set after her family celebrates her eldest daughter’s 30th birthday. This bittersweet play showcases brilliant acting by Sherry Lara, Spanky Manikan and TP Actors Company scholar Regina de Vera. Isang Araw sa Karnabal is Nick Pichay’s funny but poignant play about two former activists, both with missing loved ones, meeting again after a long time and attempting to mend broken ties. Sheenly Gener leads the cast which includes Marco Viaña and Martha Comia. Regular ticket price is Php600, P300 for students. Senior citizens also get discounts. For ticket reservation, booking of special performances and other information, please call the TP office at (632) 832-3661, 0920-9535381 or +63.928.5518645. You may also contact the CCP Box Office at (632) 832-3704 and Ticketworld at (632) 891-9999 for ticket inquiries.